The Kenstar Food Processor Tough stainless steel finger chips slicer for even and effortless slicing. Now make delicious and evenly cut finger chips for your kids or for parties, instantly. The Centrifugal and Citrus attachments are perfect for making juices rich in nutrition. Juice anything from apples and pineapples to carrots and oranges. The Razor Sharp Stainless Steel for grating Carrots, Radish, Cucumbers, Cheese and more. 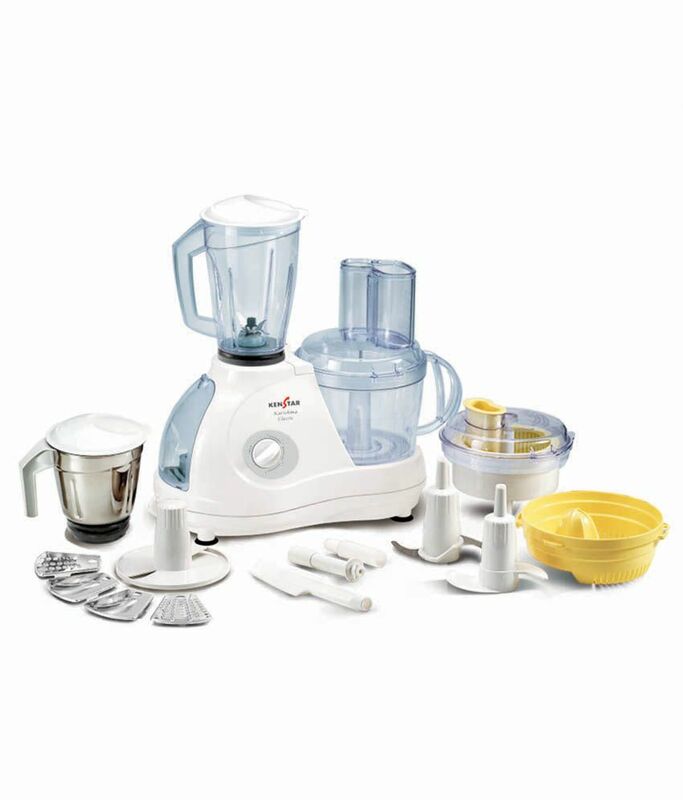 With its superior technology the Kenstar Multi-Processor handles every task amazingly, from blending, kneading, and shredding to slicing, grating and juicing. Unique In-Built Storage Compartment for accessories. Karishma Classic comes with 11 functional attachments which includes 2 jars and 9 accessories, spatula, 1.5 Litre liquidizer jar, 1.25 Litre dry/wet jar and 1.2 Litre chutney jar. It is operated by 600 watts powerful motor. To Recieve updates and possible rewards for Kenstar Karishma Classic please sign in. To Recieve updates and possible rewards for Food Processor please sign in.